Genesis 6: Prophetic Salvation and Redemptive Patterns in Noah? Pitch Within and Pitch Without! God told Noah to make an ark out of gopher wood. The Ark is a symbolic representation of humanity and the human condition. God uses the Ark to save humanity. This is also symbolic of God’s plan of salvation and redemption. God comes to the earth personally and becomes the very thing that He wants to save. By becoming a man, God is now able to save the human race. It is a fascinating concept to consider. But that is not my subject today either. So let’s look at the Ark. God told Noah to put pitch on the inside and then to put pitch on the outside of the ark. Let me stop right there and describe the human condition. Humans are spiritual beings that inhabit or dwell in a physical body. The body is the outside part that we see, the inside of a person is their spirit that we do not see. I do hope that you understand spiritual things enough to see what I am telling you is true. So what we have described to us in the form of a symbolic ark are the external vs. the internal parts or dimensions of a man. A man or a woman alive in the world today is in contact with both the natural and the spiritual worlds simultaneously, whether they know it or not. The vast majority of the unsaved people of the world are not aware of the spiritual dimension of things at all. Even a great number of carnal Christians are also oblivious to spiritual things and there lies the problem. Oh well? So we have man in two separate dimensions simultaneously, one is natural and one is spiritual and God’s plan of salvation and redemption must include both of these dimensions in order to be fully effective. Do you understand that concept? Well the story of Noah and the Ark gives us some valuable clues to how God did this and most have never seen it. You see the two words translated as “pitch” in Genesis 6:14 are not the same Hebrew words. Both Hebrew words are related to each other, in fact one word comes from the root word of the other. But one Hebrew word seems to mean something almost completely different than the other one means. So why would translators make them the same word in the English translation? That is a really good question, I guess they couldn’t figure out what other words to use so they assumed they both meant pitch. If you look at the base definition of each word the root of each word means “to cover”. To cover something implies that you are hiding something or removing something from plain view. This is an intentional act of taking something found in plain view and covering it with something else to not be seen. I personally think that this applies to God’s work of salvation. 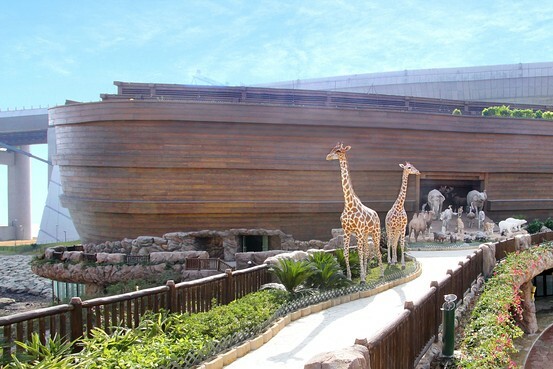 In building a physical Ark, Noah would have had to do something to make it water tight. In boat making this usually involves some coating or a sealant; especially for a wooden boat. If a wooden boat sits in water without a water tight coating, the wood would eventually become water logged with the water that you were hoping to keep out and it would probably soon leak and sink. So a coating of pitch was placed on the inside as well as the outside of the Ark to make it waterproof. But what was this covering and what is the symbolism a representation of with these two different Hebrew words translated as “pitch”? Let’s consider the facts. A human is a spirit being made in the image and likeness of God. God being a spirit being created man to look and resemble Himself. However, God limited man’s ability by confining him to a physical body. By confining the man to a physical body, he is limited to a specific three dimensional time and space. In other words, while God can be everywhere at every time all at once, man can only be in a single location at any given point of time. Man is confined to a specific environmental condition range of temperatures and living requirements. Physical man needs oxygen, food, water and other essential elements to survive in this world. By God’s intelligent design man was severely limited in a state of specific fragile circumstances in order to learn and to be able to make choices without affecting any other spiritual eternal being or spiritual place or location. While one physical human being can kill another physical human being, one physical being can do nothing to the real spirit man in their body. God created our lives as a series of lessons in a temporary natural environment so that we could choose where we will spend our eternity. Spiritual beings will never die or cease to exist somewhere. So what is a human body? Your physical body is your earth suit and it is comprised of a multitude of different physical elements and parts. The number of trace elements in the human body is over 50 different types ranging from Oxygen to Tungsten. The human body by weight is 70% water. Oxygen is the most abundant element in both the earth and the human body by weight. The top three elements in the human body are Oxygen, Carbon, and Hydrogen. It is really most interesting to note that the human body can be called a hydrocarbon unit. These are two of the key elements found in bitumen. Bitumen is a waterproofing agent used in asphalt and other areas and surfaces to keep water out. According to the Strong’s definition of the Hebrew word H3722 translated as “pitch” for the “within” inward part of the ark this word represents this type of waterproofing agent called bitumen. But if you think of the human spirit as being like the interior of the ark, it is also covered with a waterproofing surface called a body. I just think that is interesting to note. So let’s explore the human body from a different angle other than its physical composition. I personally believe that the physical human body is the only factor that gives you legal access to this planet. To be born here of a woman is the only legal entry or door into this physical world. Your physical body gives you the right to choose your eternal destiny. Jesus said unless a man is born again he cannot enter into the kingdom of heaven (John 3:3). To be born again means you first must be born the first time physically to even qualify to be born again spiritually. That is a very difficult concept for some to consider, but it also means that it severely limits Satan and the other demons from participating in God’s plan of salvation. A primitive root; to cover (specifically with bitumen); figuratively to expiate or condone, to placate or cancel: – appease, make (an) atonement, cleanse, disannul, forgive, be merciful, pacify, pardon, to pitch, purge (away), put off, (make) reconcile (-liation). This word has a lot of potential overlapping meanings. First, let’s talk about the last meaning found in this definition called “reconciliation”. To reconcile one thing to another is to restore it into right relationship. Of course in this lesson we are talking about the condition of the fallen man being restored back into right relationship with the One True Creator God. The word reconciliation is a very important theological concept given to us in the Bible. Here are some definitions for this word reconciliation. Whether you realize it or not before you were saved, you were an enemy of God. God directly opposed everything that you stood for, even though He died for your right to change and be saved. The human race was separate and directly opposed to God and everything that a Holy God stood for. After sin entered into the world, the human race was in direct opposition to God. After sin, the human nature was no longer God’s nature. Knowing this God had to do something to reconcile the situation. We have one spiritual being, God being opposed to another spiritual being, man and God’s plan of salvation includes something called “atonement”, “forgiveness”, “mercy” and “grace”. The implied ways of this reconciliation are represented to us as a cleansing process. A cleansing process involves a washing in the blood of Jesus, spiritually speaking of course. Our sins have been purged or annulled by the shed blood of Jesus. Through what Jesus did for us as a man on the cross, God was able to forgive our sins and to cleanse us from all unrighteousness. Now we have been given the ministry of reconciliation. What is that? It means to go and tell people, God is not mad at them. God is not opposed to them anymore. They are not God’s enemies anymore. God has invited them to be His friend and a part of His family. From H3722; properly a cover, that is, (literally) a village (as covered in); (specifically) bitumen (as used for coating), and the henna plant (as used for dyeing); figuratively a redemption price: – bribe, camphire, pitch, ransom, satisfaction, sum of money, village. You see in these verses, Jesus Christ is said to be the price paid for our redemption. Jesus gave himself for a ransom. A ransom is a sum of money you pay to a kidnapper to get your child back. Apparently the human race belonged to or was taken captive by someone that had to be paid in order to get us back to God. What are we talking about though? We are only talking about the human body. The spirits of the man and women were already forgiven and reconciled to God. What we find is that God had to pay a price for the bodies of the human race. In this verse God prophecies that man will be redeemed without the payment of cash, gold, silver or monetary value changing hands. God makes a statement that the human race had sold themselves and gotten nothing in return or of value for their stupid act. So God’s plan of salvation and redemption did not cost Him any money either, but it was certainly not FREE!. You see if you look for verses in the Bible, you will see that we are still waiting for the full redemptive work of God to be accomplished. We still have mortal temporary bodies on this planet and according to the Bible we will be transformed on the outside very soon and all get new bodies that our spirits can live in forever. God writes in Roman’s 8:23 that we are all awaiting this to happen with anxious anticipation. A groaning is applicable to a birthing process, I believe. God has already paid the price for our redemption, but yet we still await the redemption of our bodies. It is a very complex subject, I know. I hope you enjoyed this lesson on the pitch within and the pitch without and how it relates to the Word of God for the salvation and redemptive work of Christ. This two part work of God completed the salvation which involved the forgiveness of the human spirit as well as the purchased redemption of our bodies. God has hidden little things like this in the Bible for a reason and they can only be seen if you look for them diligently. I pray that you see them and understand them. Until my next blog, God Bless You.